Taika Waititi's other films include Boy (2010) and What We Do in the Shadows (2014). 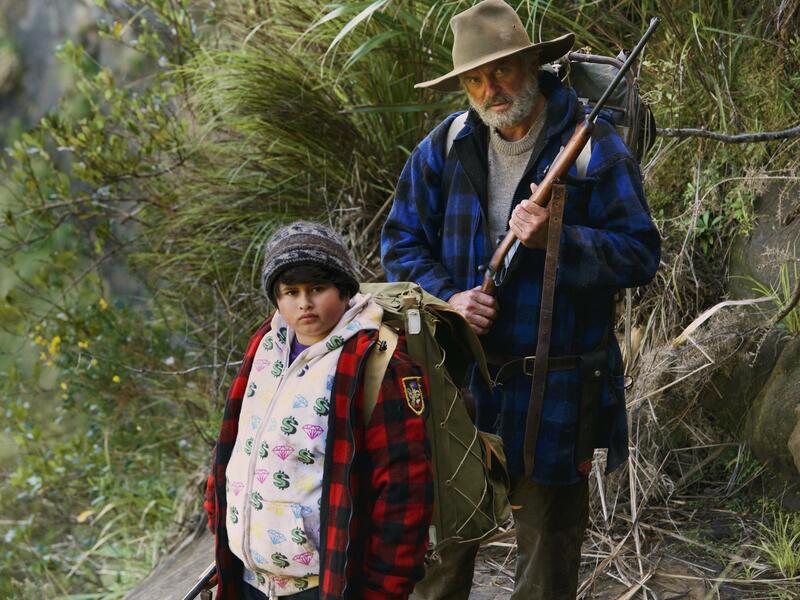 Ricky the city kid (Julian Dennison) and Hector the mountain man (Sam Neill) journey through the wilderness in Hunt for the Wilderpeople. One of Waititi's best-known films is a mockumentary called What We Do in the Shadows — think of it as Spinal Tap with vampires. Waititi co-directed the film, and he also plays Viago, a neat freak vampire who shares a house with three other bloodsuckers. New Zealand actor Sam Neill describes the mockumentary as "four vampires of various antiquity living in a ghastly sort of student, New Zealand [house] — just the kind of thing that I was in when I was at university." It's one of the films that made Neill want to work with Waititi on his new film, Hunt for the Wilderpeople. Waititi is half Maori, the indigenous people of New Zealand. His 2010 film, Boy, centers around a group of Maori children in a poor, coastal village, much like the one Waititi grew up in. The boy in the film longs to have a relationship with his pot-smoking, ex-convict dad. Boy was a tremendous hit in New Zealand, and it was also nominated for an Oscar. Waititi thinks part of its appeal was that it didn't perpetuate stereotypes. "Indigenous people in films, it's all like nose flutes and panpipes and, you know, people talking to ghosts ... which I hate," he says. "We really wanted to throw that whole thing away." Actor Sam Neill calls the film extraordinary. "I thought [it was] the funniest thing I'd ever seen when I first saw it," he says. "And then I saw it a second time [and] I thought it was quite the saddest film I've ever seen." That poignant humor is on full display in Waititi's new movie. Hunt for the Wilderpeople opens with aerial footage of the lush, mountainous region of northern New Zealand. A lone police car winds up the hillside to a small house. It's a child welfare worker dropping a foster kid, Ricky, off at his new home. The welfare worker seems straight out of a Roald Dahl story: She's a cruel adult who has no business working with kids. She tells the boy's new foster mom that he's "a real bad egg." Not long after, a grizzled, bearded hunter, played by Sam Neill, walks toward the house. His name is Hector and he's Ricky's reluctant foster dad. He glares at the group as he walks by. Ricky is a chubby Maori boy dressed in a hoodie and baseball cap — a typical city kid. But there's a sweetness to the Tupac-loving foster kid, and to his new foster mom. "You gonna run away tonight?" she asks her ward. "It's cool with me," she says. "Just make sure you're back by breakfast." Without giving too much away, soon Ricky the city kid and Hector the mountain man are on a journey through the wilderness. "It's just like Laurel and Hardy in the wilderness," Waititi says. The filmmaker especially liked taking the character Ricky out of his comfort zone. "I just thought it would be very funny for a kid who's obsessed with Tupac and being a tough kid on the streets of the city to be thrown out into the harsh realities of the New Zealand winter." Thirteen-year-old Julian Dennison plays Ricky. He says he likes how Waititi uses humor to address a painful situation: "Behind Ricky and all of the things he's been through and foster care, you know, it's actually a really sad film. But [Waititi] also incorporated jokes so kids can go and watch it and adults, which was a really special idea to draw people in, talking about these serious things but also having a humor to it and, you know, a laugh to it." Waititi attributes his sense of humor to his upbringing: His mother is of Russian-Jewish heritage, and his father is Maori. "So there [are] two great backgrounds there," he says. "Two very different cultural backgrounds, but two people who have dealt with a lot of oppression and I think really used humor in storytelling to make sense of the world." Minister: You know, sometimes in life it seems like there's no way out. Like a sheep trapped in a maze designed by wolves. And you know that if you're ever in that situation, there are always two doors to choose from. And through the first door — oh, it's easy to get through that door and on the other side waiting for you are all the nummiest treats you can imagine. Fanta, Doritos, L&P, burger rings, coke zero. But you know what? There's also another door. Not the burger ring door, not the Fanta door. Another door that's harder to get through. Guess what's on the other side? Anyone want to take a guess? Minister: No not vegeta ... No. Minister: You would think Jesus. I thought Jesus the first time I come across that door. It's not Jesus. It's another door. And guess what's on the other side of that door? Minister: Yeah, Jesus. He's tricky like that, Jesus. That's classic Taika Waititi. He says people need humor, even in the most traumatic moments. "We're like moths, you know, we're really attracted to the light. And that's what's cool, I think, about being humans, is we're very positive despite so many negative things happening in the world; we're a very positive species. That gently twisted but empathetic sense of humor has gotten Hollywood's attention: Waititi is now directing Marvel's next Thor movie. Taika Waititi is an actor and director whose offbeat sense of humor is well-known in his native New Zealand. Here in the U.S., he has something of a cult following. And this weekend, he has a new movie out called "Hunt For The Wilderpeople." NPR's Elizabeth Blair has this profile. ELIZABETH BLAIR, BYLINE: One of Taika Waititi's best-known films is a mockumentary he co-directed called "What We Do In The Shadows," a sort of "Spinal Tap" meets vampires. TAIKA WAITITI: (As Viago) So it's 6 p.m. in the night time, which is when I wake up. BLAIR: That's Waititi playing Viago, who shares a flat with three other vampires. JOHNNY BRUGH: (As Deacon) I do my flat chores. JEMAINE CLEMENT: (As Vladislav) No, you don't. WAITITI: (As Viago) No, you don't. BRUGH: (As Deacon) Yes, I do. WAITITI: (As Viago) That's why we're having having the flat meeting. CLEMENT: (As Vladislav) The point is, Deacon, that you have not done the dishes for five years. BLAIR: It's movies like this one that made New Zealand actor Sam Neill want to work with Taika Waititi. SAM NEILL: Four vampires of various antiquity living in a - in a ghastly sort of student New Zealand apartment - just the kind of thing that I was in when I was at university, living in the same horrible conditions (laughter). WAITITI: (As Viago) Oh, it's a spinal column. Yuck. BLAIR: Waititi is half Maori, the indigenous people of New Zealand. His 2010 film, "Boy," centers around a group of Maori children in a poor coastal village, much like the one Waititi grew up in. JAMES ROLLESTON: (As Boy) I go to Raukokore school. I have many favorite subjects, including art, social studies and Michael Jackson. BLAIR: The boy in the film longs to have a relationship with his dad, a pot-smoking ex-convict. "Boy" was a tremendous hit in New Zealand. It was also nominated for an Oscar. Waititi thinks part of its appeal was that it didn't perpetuate stereotypes. WAITITI: And yeah, indigenous people in films - it's all, like, nose flutes and panpipes and, you know, people talking to ghosts and [expletive] and that, you know, which I hate. So, you know, it's like we really wanted to throw that whole thing away. NEILL: "Boy" was quite an extraordinary film. BLAIR: Again, actor Sam Neill. NEILL: I thought it the funniest thing I'd ever seen when I first saw it. And then I saw it a second time. I thought it was quite the saddest film I've ever seen. BLAIR: In Waititi's new movie, that poignant humor is on full display. BLAIR: "Hunt For The Wilderpeople" opens with aerial footage of the lush, mountainous region of northern New Zealand. A lone police car winds up the hillside to a small house. A child welfare worker is dropping off a foster kid to his new home. She seems straight out of a Roald Dahl story - the cruel adult who has no business working with kids. She tells the boy's new foster mother he's a real bad egg. RACHEL HOUSE: (As Paula) We're talking disobedience, stealing, spitting, running away, throwing rocks, kicking stuff, defacing stuff, burning, loitering and graffiting. And that's just the stuff we know about. BLAIR: From over the hill, a grizzled, bearded hunter, played by Sam Neill, walks toward the house, carrying a huge, dead pig on his back. He glares at them as he walks by. HOUSE: (As Paula) Who's that Crocodile Dundee guy over there? RIMA WIATA: (As Bella) Oh, that's my husband, Hector. UNIDENTIFIED ACTOR: (As character) Whoa, he's giving that pig a piggy-back. BLAIR: The foster child is a chubby Maori boy, dressed in a hoodie and a baseball cap - a typical city kid. JULIAN DENNISON: (As Ricky) Man, you guys got a lot of dead stuff around here. I saw a dead sheep the other day - had maggots in it. BLAIR: But there's a sweetness to the Tupac-loving Ricky and to his new foster mother. WIATA: (As Bella) What's a Tupac? DENNISON: (As Ricky) It's just my - this really cool rapper. And he's, like, my best friend. WIATA: (As Bella) You going to run away tonight? DENNISON: (As Ricky) Not sure. WIATA: (As Bella) Oh, well, it's cool with me. Just make sure you're back by breakfast. BLAIR: Without giving too much away, soon Ricky, the city kid, and Hector, the mountain man, are on a journey through the wilderness. NEILL: (As Hector) All right, we got no choice but to camp out here for a few weeks. DENNISON: (As Ricky) But I'm hungry. NEILL: (As Hector) There's plenty to eat if you know where to look. DENNISON: (As Ricky) Well, I don't know where to look, Hector. And also, I ran out of toilet paper. Give me some of yours. DENNISON: (As Ricky) I got to poop. I need to poop. You need to poop. We all poop. NEILL: (As Hector) Use a leaf. DENNISON: (As Ricky) A leaf? I hate you. NEILL: (As Hector) And bury it. DENNISON: (As Ricky) I'll bury you. WAITITI: It's just like Laurel and Hardy in the wilderness. BLAIR: Filmmaker Taika Waititi says he especially liked taking the character Ricky Baker out of his comfort zone. WAITITI: I just thought it would be very funny for a kid who's obsessed with Tupac and being a tough kid on the streets of the city to be thrown out into the harsh realities of New Zealand winter. DENNISON: He thinks he's gangster. He thinks he's cool. He thinks he's smart. BLAIR: Thirteen-year-old Julian Dennison plays Ricky. He says he likes how Taika Waititi uses humor to address a painful situation. DENNISON: Behind Ricky and all of the things he's been through in the foster care, you know, it's an - actually a really sad film. But he also incorporated jokes, so kids can go and watch it and adults like it, which was a really special idea to draw people in. BLAIR: Waititi believes that comes from his upbringing. Waititi's mother is of Russian-Jewish heritage. His father is Maori. WAITITI: So two people who have dealt with a lot of oppression and, I think, really use humor and storytelling to make sense of the world. 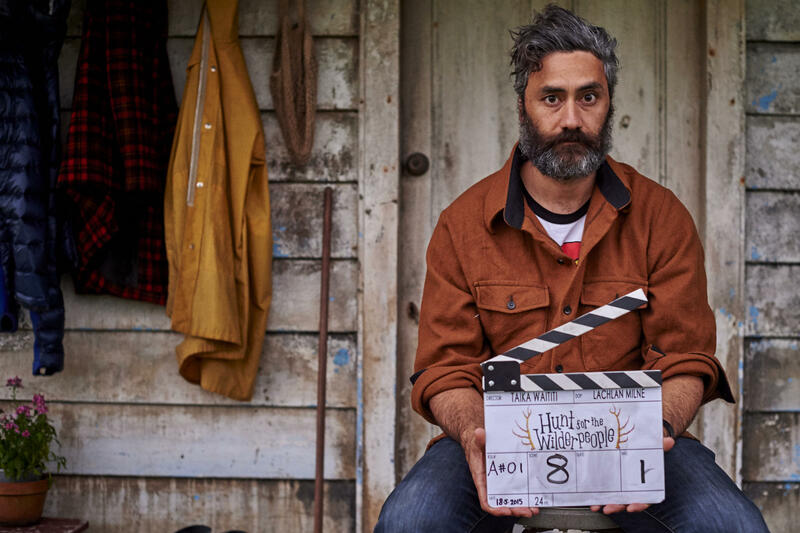 BLAIR: Waititi makes a cameo in "Hunt For The Wilderpeople." WAITITI: (As priest) You know, sometimes in life, it seems like there's no way out. BLAIR: At a funeral, he plays the priest, who delivers an unusual sermon. WAITITI: (As priest) If you're ever in that situation, there are always two doors to choose from. And through the first door - oh, it's easy to get through that door - and on the other side waiting for you are all the yummiest treats you could imagine - Fanta, Doritos, L&P, Burger Rings, Coke Zero. But you know what? There's also another door - not the Burger Ring door, not the Fanta Door - another door that's harder to get through. Guess what's on the other side. Anyone want to take a guess? BLAIR: That is classic Taika Waititi, though he says he actually heard a sermon like that. WAITITI: It's really indicative of how humans deal with stress and with trauma is to laugh it off and to, like, find ways to - you know, we are really creatures. We're like moths, you know? We're really attracted to the light. And that's - that's what's cool about - I think about being human, is we're - you know, we're very positive, you know, despite so many negative things happening in the world. We're very - we're a very positive species. BLAIR: Taika Waititi's gently twisted but empathetic sense of humor got Hollywood's attention. He's now directing Marvel's next Thor movie. Elizabeth Blair, NPR News. Transcript provided by NPR, Copyright NPR.